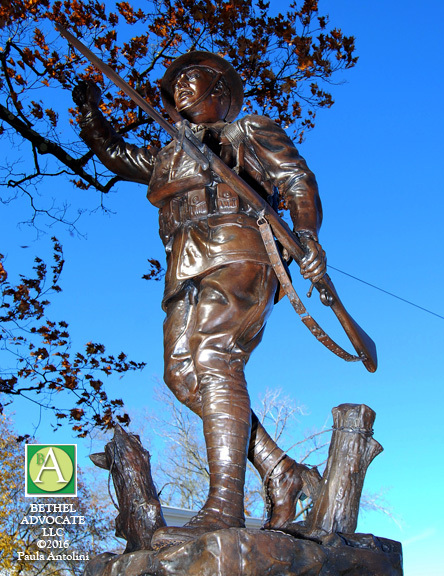 A rededication ceremony of E.M. (Earnest Moore) Viquesney’s “The Spirit of the American Doughboy” statue took place yesterday at 11:45 a.m. in P.T. 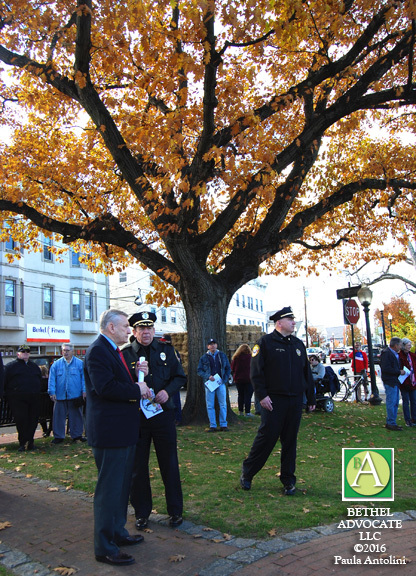 Barnum Square, appropriately on Veterans Day. 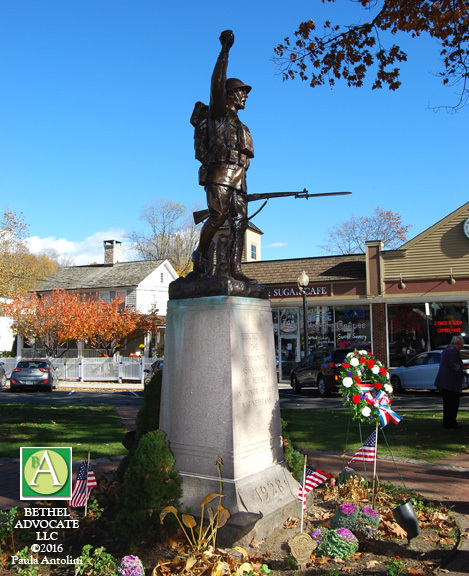 The statue, originally dedicated on May 31, 1928, was recently returned to Bethel on November 4th, following extensive restoration work in the last months, starting on July 21, 2016. 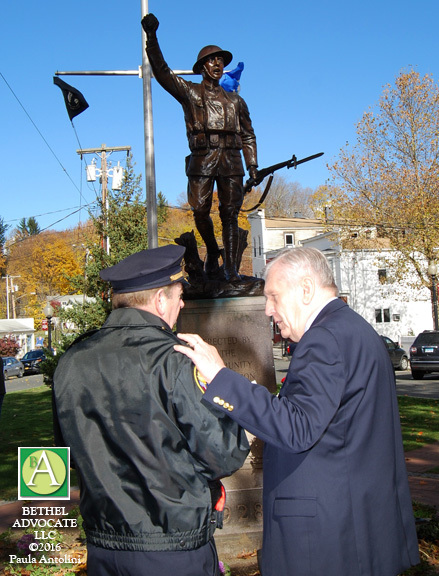 A rededication ceremony of E.M. (Earnest Moore) Viquesney’s “The Spirit of the American Doughboy” statue took place yesterday at 11:45 a.m. in P.T. 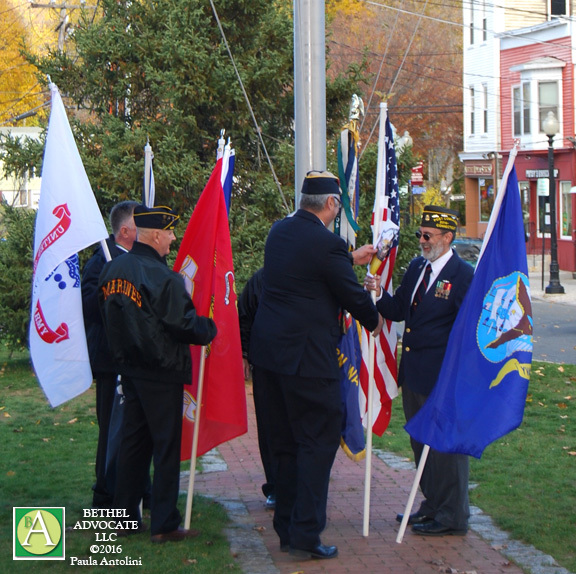 Barnum Square, appropriately on Veterans Day. 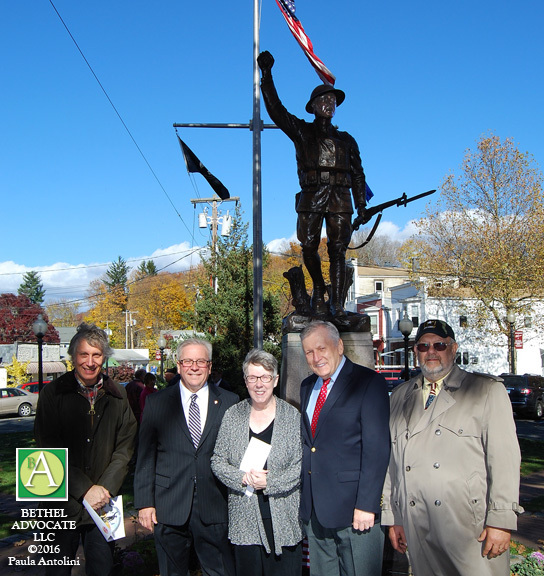 The statue, originally dedicated on May 31, 1928, was recently returned to Bethel on November 4, 2016, following extensive restoration work in the last months, starting on July 21, 2016. The Bethel Historical Society president Pat Rist lead the rededication ceremony that she described as a special occasion, 88 years after the original dedication. 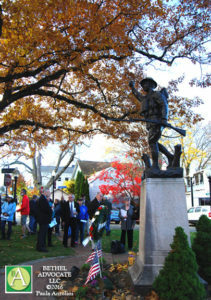 Rist said, “The process began with David Gesualdi,” a local sculptor whose work includes the Veterans Memorial statue on the CJH Municipal lawn and and also the P.T. Barnum statue on the Bethel Public Library lawn. 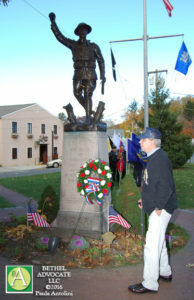 Rist stated that Gesualdi originally called her and asked her to meet him at the statue, along with a representative from Polich Tallix, a fine art foundry who does restoration work, when he noticed the bottom of the Doughboy statue had started to lift off the base and a “powdery substance” was pushing the statue upward. The Bethel Historical Society then received a quote for the restoration work from Polich Tallix, and they presented it to First Selectman Knickerbocker who showed it to the Board of Selectman and it was approved unanimously to move forward with restoration work. 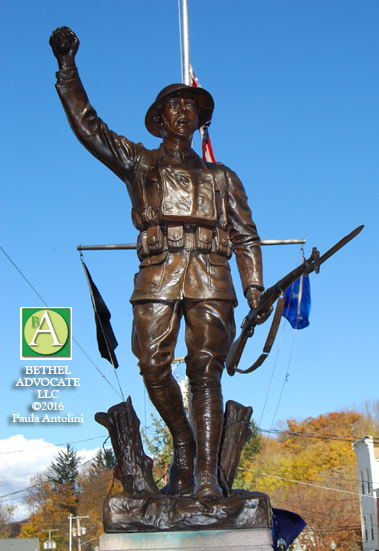 Pollich Tallix had not only done work on the Bethel Veterans Memorial statue and the P.T. 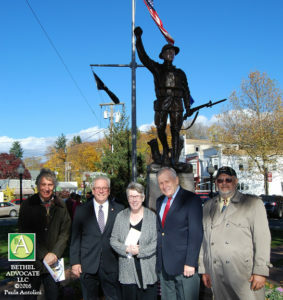 Barnum statue, but had also worked on the Statue of Liberty and the “Genius of Connecticut” which is a winged female figure that sat atop the capital dome, Rist said. 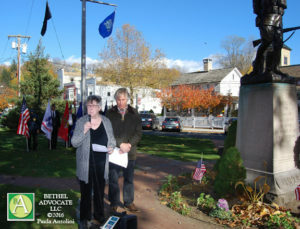 The new “Genius of Connecticut” currently sits inside the building, Rist said, and will probably be installed on the dome again when funds permit. How was the original Doughboy paid for? 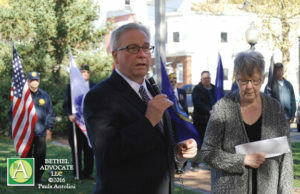 It involves the Masonic Temple, the Congregational Parish House, built in 1912, no longer standing,” Rist said. Previously located at 82 Greenwood Avenue in Bethel, CT, “It was later sold to the Community Association, and their plan had been to turn that into a Community House and turn it over to the veterans, but unfortunately that never happened. 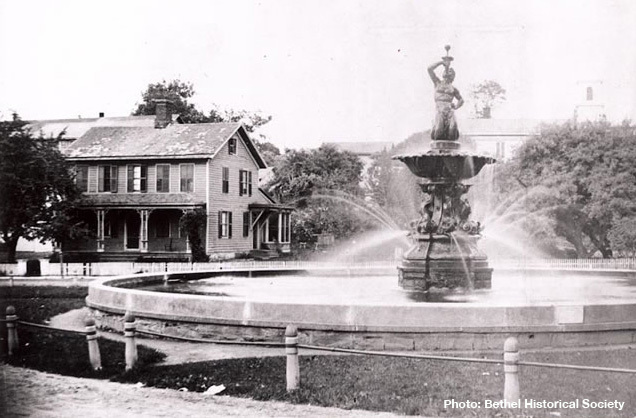 So in 1927 it was sold to the Masons for Bethel’s Masonic Temple. 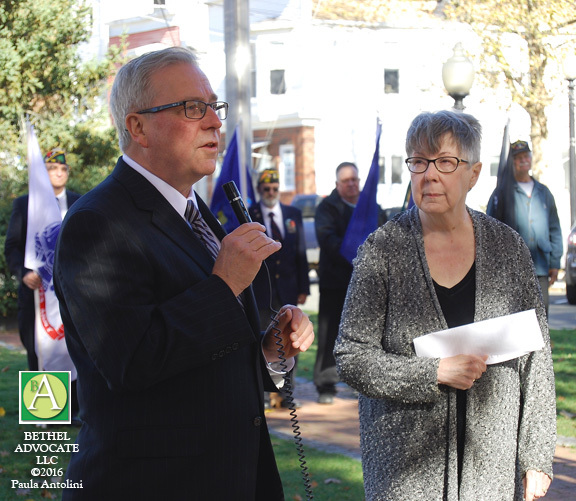 The money raised from the sale of the building was then put towards the purchase of a Doughboy that went up in 1928,” said Rist. 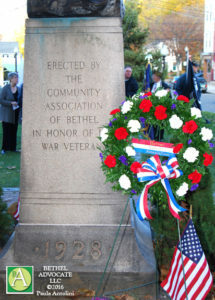 Note: “Erected by the Community Association of Bethel in Honor of Her War Veterans” is on the statue’s base. There were various prices for the Doughboy ranging from $1,000 to $1,500 plus shipping, excluding the cost of the pedestal and installation. As the depression hit, the cost dropped to about $700. 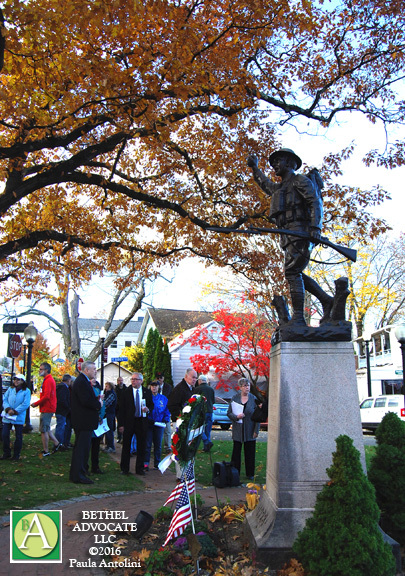 “It took four years to come up with a decision to put a Doughboy in the square. From 1924 to 1928 when the famous Bethel fountain was removed from the square, the space was empty. 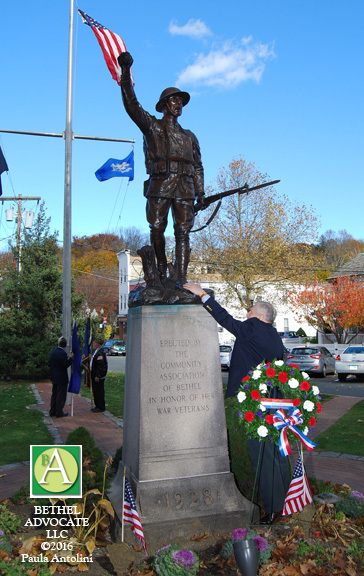 And they finally came to a decision that the Doughboy was the best way to go,” Rist said. Photo above shows same view of P.T. 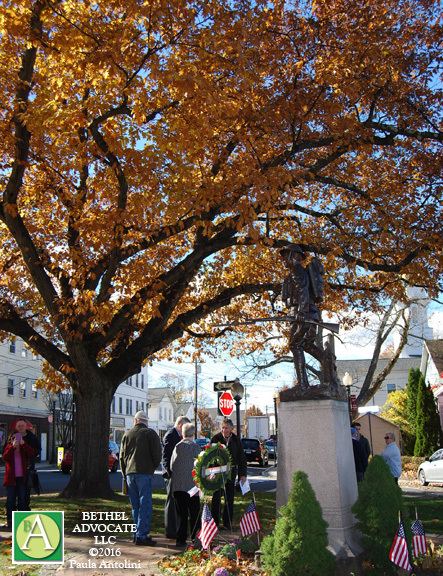 Barnum Square (note house in background) on November 11, 2016, with doughboy statue. “The Doughboy honored 175 men of Bethel who saw service in WWI, of which, three died serving their country and they’re buried here in Center Cemetery,” said Rist. The three young men that died were: James Masson, the first young man who enlisted, was a member of the regimental band organized in Newark, N.J.; James H. Trowbridge, U.S. Marine Corps; Henry Bromley, member of the 56th Coastal Artillery Guard. 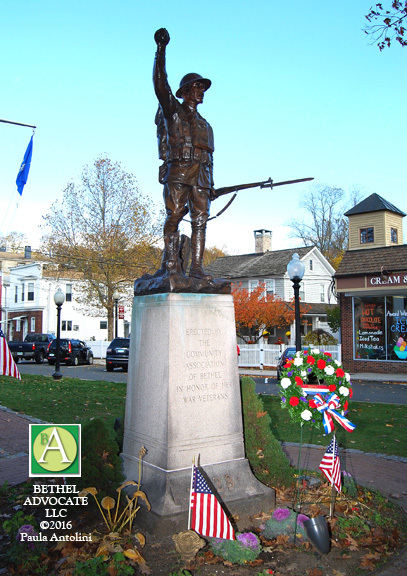 With the approval of First Selectman Knickerbocker a mold was allowed to be made from the Bethel statue while at Polich Tallix, to install a Doughboy in Harrison New York. It will not be called a Viquesney, it will simply be a copy, Rist said. The making of the mold did no damage to the Bethel Doughboy statue. Photo above: Bethel First Selectman Matt Knickerbocker speaking at the doughboy rededication event, Bethel Historical Society president Pat Rist is on right. The Bethel Board of Selectman were also present at Friday’s event, First Selectman Matthew Knickerbocker, Selectman Richard Straiton and Selectman Paul Szatkowski, representing the Town of Bethel. First Selectman Knickerbocker said, “Over the years, since 1928, if you look back through publications, through Chamber of Commerce materials, all different kinds of printed materials, there is one image that stands out as the symbol of Bethel and he’s right there (points to doughboy statue). There’s no single sculpture that defines Bethel over the years, more than this one.” Knickerbocker did acknowledge Dave Gesualdi’s two sculptures in town, the Veterans Memorial statue at the CJH Municipal Center and the P.T. 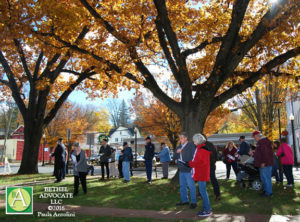 Barnum state at the Bethel Public Library, saying those pieces, “are giving him [Doughboy] some competition,” but said that the image of the Doughboy is the one you will mostly find on printed materials. 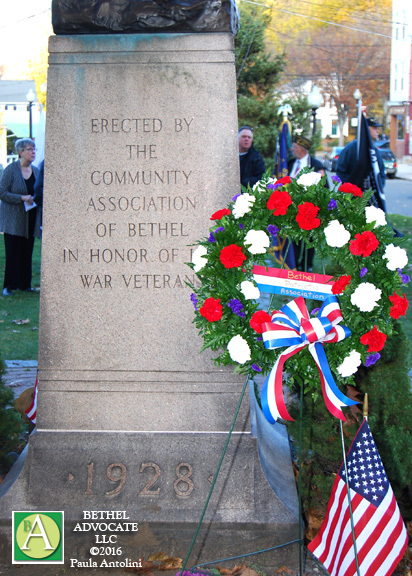 “This is the symbol of Bethel that we’ve all come to love,” Knickerbocker said. 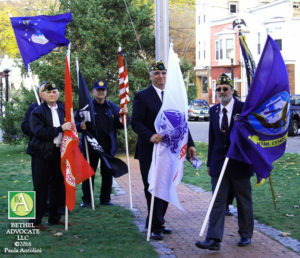 Veterans from various branches of the military also stood tall in the square, holding military flags and the American flag, that blew furiously in the November wind this day, along with a flurry of fall leaves. A crowd of about seventy-five people attended the ceremony. Bethel is fortunate to have one of two Doughboys here in Connecticut. 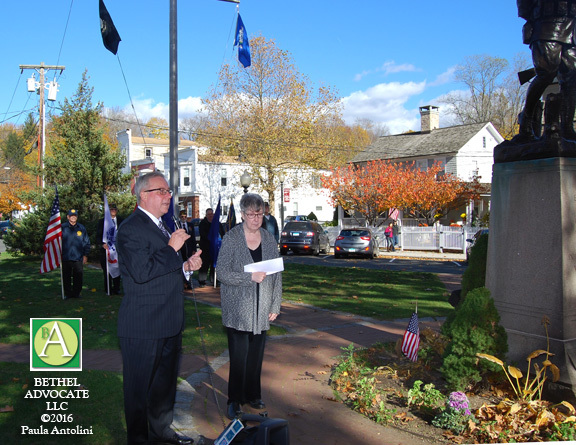 The second is located in North Canaan. Viquesney’s last Doughboy was delivered to Verona PA in 1943.